Let’s hop right into the highlights of this week’s patch! We’re receiving several eggcellent changes hot off the press from the latest edition of the developer’s diary. Score an even bigger haul when out laying waste to all those monsters, accessories can now drop at PRI and DUO enhancement levels. Speaking of loot, we’ve reduced the weight of miscellaneous monster drops as well! While you’re getting ready to try out the new simplified Fort & Command post construction system, be sure to check out the latest events. Players can scavenge eggs from all over the world of Black Desert Online for rewards, or tackle special world quests from the foolish and mischievous Shepherd Boy! During the event period, Finish Quests, Defeat Monsters, Gather, and Fish to get eggcentric EGGS!! Claim your [Event] Flondor Goose Eggs and [Event] Black Spirit Flondor Goose Eggs through various fun-filled ways. Full details on this eggcellent event soon! April’s Fools event, the ‘Shepherd Boy’ has begun. During the event period, help the Shepherd Boy protect his sheep from the scary wolves. But don’t be fooled from every warning the boy alarms! Beware! If you lure the wolves too far away from the sheep, they will steal your rewards! Click < Here > for full details on this foolish yet fun event! Attendance rewards for ‘Returning’ tab has been refreshed. Black Spirit’s Adventure 2 has ended. A new item ‘Adventurer’s Tome’ has been added. Complete a Black Spirit quest Black Spirit’s Gift (Adventurer’s Tome) if your character is Lv. 53 to receive one. While you are equipping Adventurer’s Tome, the amount of Prognyl Silver Bar you get from relevant quests will increase by 20%. Items related to Cron Meals and Draughts have been added. Ancient Cron Spice: An ingredient used in cooking. It can be bought from Cooking Merchant or Innkeeper NPCs. Tears of the Falling Moon: An ingredient used to make Draughts. It can bought from Old Moon Manager NPCs. 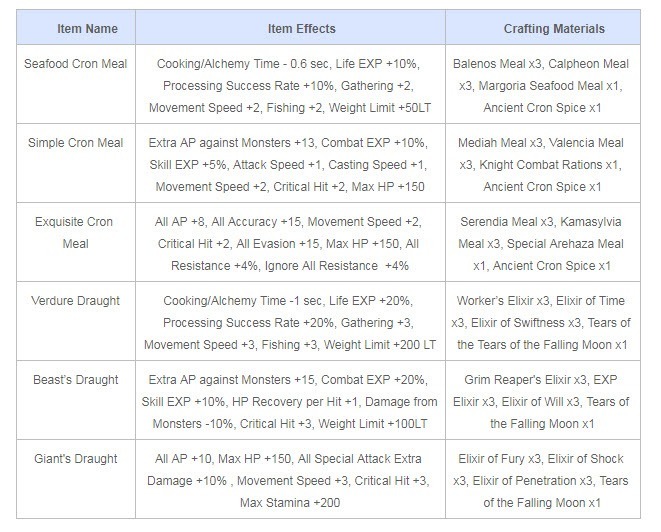 Cron Meals (a new type of food) and Draughts (a new type of elixir) have been added. You can get great buffs from them. You can use Simple Cooking/Alchemy to make Cron Meals/Draughts. All the effects of a Cron Meal or Draught will be shown on a single icon, allowing you to better check and manage your Character’s buffs. The effects of Cron Meals and Draughts cannot be stacked with other food or elixirs. If you consume a Cron Meal/Draught while the effects of another food/elixir is in effect, the old effects will disappear and the effects of the Cron Meal/Draught will be applied. If you consume a food item while a Cron Meal is still in effect, the item will be consumed but the only effect you will get from it is Health EXP gain. While a Draught is in effect the effects of elixirs will not be applied, excluding those of Perfume of Courage, Perfume of Swiftness, Elixir of Deep Sea, Khalk’s Elixir, Spirit Perfume Elixir, Whale Tendon Elixir or Tough Whale Tendon Elixir. Cron Meals and Draughts can be used simultaneously. However if a Cron Meal/Draught is still in effect and another type of Cron Meal/Draught is consumed, then the effects of the original Cron Meal/Draught will be replaced with that of the newly consumed Cron Meal/Draught. For example, if you first consume a Seafood Cron Meal and then consume an Exquisite Cron Meal, only the effects of Exquisite Cron Meal will be applied. When crafting Cron Meals and Draughts, you can substitute ingredients with high grade ingredients. For example instead of Balenos Meal x3, you can use Special Balenos Meal x1. Field HQ, Command Post, or Forts will now be automatically built one hour after being placed automatically, without the need to add Materials or send Workers to build it upon joining a Node/Conquest War. Once they are fully built, they cannot be disassembled. You may install or disassemble a Field HQ, Command Post, or a Fort until a minimum of 2 hours before the Node/Conquest War begins. Field HQ, Command Post, and Forts will count and be visible on the World Map upon installation even if not complete. The information regarding fort construction residing in the Worker Knowledge category is now deprecated and will be adjusted later. Lemoria Armor has been modified to have Set Effects when wearing 2, 3, and 4 parts. Deleting a friend from the friend list will also remove yourself from the target’s friend list. Friends that have been deleted from your friends list prior to this update will now also result in you being removed from their list. If you delete a friend while private messaging that friend, you cannot send any more messages. If you add that friend back, you can pick up from where you left off. Please Note: Messages with deleted friends will only be kept while you are currently still online, logging out of the game will clear the cache and the messages will be lost. An alert will now appear if your gamepad is disconnected. Fixed the issue where the client was intermittently crashed during Cooking or Alchemy. Marni has been instructed to no longer conduct science experiments on the rocks near Marni’s Lab, we have restored the gravity in the area and they should no longer be floating. Fixed the unnatural camera perspective caused by talking to some Pilgrim NPCs in Pilgrim’s Sanctum. Fixed the issue where some Villagers in Heidel were displayed as Serendia Soldiers. These imposters have been sent home and the real villagers have returned to their appropriate places. The name and dialogue script of some Calpheon Laborer NPCs have been modified. Fixed the issue where Quest Summary of Befriending Trees did not match with the name of the target NPC. Some of Marni’s anti-gravity rock potions were used on the rocks around Heidel Castle. We have restored the gravity to these rocks, they will now no longer be levitating. Fixed the issue where NPC Slum Dweller in Calpheon City became invisible upon interaction. The invisibility cloak he was using has been confiscated and properly locked away. Fixed the awkward looking placement of curtains or shelves when installed in certain Residences. Diné the Dream Horse can now freely use all the skills in the Great Desert area as it does in other places. The size of the grass that appears when Diné the Dream Horse walks or runs is bigger and the grass effect overall has been made more prominent. The death penalty system of mounts has been changed. The Death Count of a horse will no longer affect its Breeding or Exchange results. The Max Stamina of mounts will no longer be reduced based on the number of mount deaths. You may still check and reset the mount’s death count from the stable. The item description for Mount Resurrection Reset items has been amended to be clearer. The Mount Resurrection Reset Pearl item has been changed to [Loyalties] Mount Resurrection Reset. Due to the mount death system being revised, [Loyalties] Mount Resurrection Resets can be applied to a horse with no limit. Adventurers who have purchased or received ‘Mount Resurrect Reset’ items (unused) before March 28th maintenance will be refunded with its original price for any ‘Mount Resurrection Reset’ in the adventurers’ Inventory or Storage. Corresponding items will be deleted and refunded Pearls will be sent via in-game Mailbox (B). ‘Mount Resurrection Reset’ items received as a Gift will be refunded to the receiver. Even if you are currently not riding that mount if the mount is out of the Stable and carrying trade items, the teleport function will not work. You can no longer have on the Underwear Settings while equipped with a Matchlock or musical instrument. Fixed the issue where some skills spun not only monsters but also Characters. Skill visual effects will now be displayed correctly even when you are using a Lantern. All female classes have had a new voice option added (Beauty or Character Creation window > Customizing > Voice ). Fixed the issue where the skill Solar Flare’s, burn and bleeding effect wasn’t being applied after using the skill Head Chase. Fixed the issue where switching back to non-combat stance from combat stance (Longsword) while moving forward then stopping in the middle would set the player back into combat stance. Fixed the issue where Warrior’s skill Charging Thrust was being applied as the skill Kick while Sprinting in combat stance. Fixed the issue where skill combo with RMB was unavailable while using the skill Ground Roar. Fixed the issue where the cutting motion with controls would not show while using the skill Absolute: Sideways Cut IV. Fixed the skill effects when using the skill Penetrating Wind during cooldown. EP Recovery per hit information has been added to the description of Dagger of Protection. Fixed the graphical glitch on Sorceress’s arm in New Year Hanbok top caused with certain Customization settings. Fixed the description of the skill Bloody Calamity to reflect the actual reduced amount of accuracy decrease. Fixed the issue where characters would be knocked down in different directions when using the skill Ultimate: Dark Flame. Fixed the issue where the Knockdown effect was applied to the Smash Attack of Violation when used during cooldown. The effect of pushing monsters has been added to the description of the skill Violation. In order to ensure a smoother gameplay experience, optimization revisions were performed on the Sorceress class. Optimization revisions on other classes will follow after this one. Fixed the graphical glitch on the other hand of the Berserker when having Bheg’s Gloves equipped. When applying multiple Shocked effects to a target, the one with the best speed decrease effect will be applied. Fixed the unnatural looking graphic issue on Witch’s hair in Lahr Arcien (R) Hat. Fixed the issue where sometimes Raise Hair checkbox would remain checked even after clicking on Edit History in Beauty Salon (F4). Raise Hair checkbox will be unchecked while switching between young and old face of the Wizard. Fixed the issue where the wizards ears could not be made symmetrical when Customizing the character. The amount of WP Recovery on successful hits from the skill Crescent Blade Training has been increased to 20. Dash Attack Hit Damage of the skill Crescent Blade Training has been changed to 346% x 3 to correctly represent the actual damage inflicted. Fixed the description of Forward Hit count to correctly represent the actual Forward Hit count for the skill Crescent Blade Training. The amount of WP Recovery on successful hits from the skill Kerispear Training has been increased to 20. Fixed the graphical awkwardness in the chest area of the Kunoichi with Spring Blossom outfit on when wielding the Main Weapon and Awakening Weapon stance in customization. Fixed the issue where the knockback from the skill Absolute: Darkness Burst was not correctly applying to nearby characters. Fixed the issue where Blazing Inferno Gloves were disappeared when putting on Blazing Inferno Gauntlet. The Pull in effect has been added the description of the skill Dragon’s Rip. Fixed the unnatural looking appearance of the Mystic’s New Year Hanbok when the costume was wet. Monsters that previously dropped blue or higher grade accessories will now drop PRI and DUO accessories at a low rate. The item descriptions of the following items has been changed to say that they will be completed automatically after 1 hour. 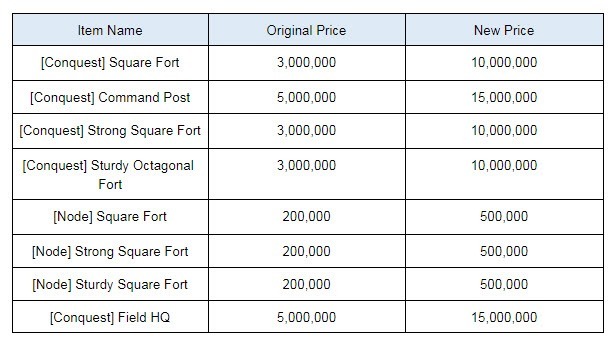 These items will no longer need materials for construction, so their prices have been changed as follows. Any forts under construction during maintenance will have been auto-completed to reflect the changes above. The weights of the miscellaneous monster drop items you obtain from Balenos, Serendia, and Calpheon have been reduced to 0.01LT. Fixed the issue where Mass Exchange window was intermittently displayed when exchanging Asula’s Weakened Magic from an NPC. When using the pre-order function using a Transaction Maid, Silver will be drawn from the storage in cities (capital). Silver from small town storages will not be used for these cases. Thanks to your support, Rare Critter Box will be sold for 1 more week. Rare Critter Box will be available in the Pearl Shop before April 4th maintenance. Monsters who go into hiding mode/disappear will also have their effects hidden now. The attack route of Saunil Immobile Catapult from Trina Fort has become more natural. Gyfin Rhasia Crusher’s rotating attack motion has been adjusted to look more natural. The Desert Iguana and Gorgo Cobras located around the Node Manager for Gorgo Rock Belt have been relocated. Fixed the issue where Combat EXP could be earned from defeating summoned boss monsters for the main quests. The item drops from the Boss monster at the Advanced Altar of Training will now properly vanish when the body disappears. How to obtain a Flute has been added to the quest summary of Pick Weeds with a Pig. Fixed the incorrect navigation point on the quest [Gathering] Lacy Hates Hides. Fixed the unnatural navigation for the quest For Serendia. A location indication effect has been added so that you can find your boat/ship better. Parking effect visible only to yourself has been added to Rowboat, Fishing Boat, [Guild] Galley, Epheria Sailboat, Epheria Frigate, and Old Bartali Sailboat. Fixed the issue where the Enhancement button would be deactivated when an item and Black Stones were put into the Enhancement window, and the button for Extract Chance was clicked. In the Dye (J) screen, characters equipped with Awakening weapons will now take Awakening poses. Fixed the issue so that you can now change Texture Quality without issue. Texture Quality will be set at Medium by default when clicking on Reset All from Settings. One of the options in Settings>General Settings>Show/Hide has been renamed. A new description has been added to the Empty Bottle item, that states: Automatically gathering will now be stopped once a Special Resource has been found. The Black Spirit’s wiki icon will no longer be displayed when the Weight Limit alert is set to off. Fixed the issue where some Dairy Cows in Olvia dug at the ground upon interaction. Fixed a bug that intermittently occurred while gathering underwater. Fixed the issue where you could catch unreleased fish in some border areas of Kamasylvia. Fixed the issue where weapons would sometimes be force-sheathed when an error message “Resource does not exist” was displayed. Fixed the issue where Annexes could be installed in invalid locations. Fixed the issue where the helmet of a set would continue to be displayed as equipped on the preview section when trying on outfits in the pearl shop, while the Venia Riding Attire was equipped initially. Fixed the issue where ending time for reservation would not be displayed properly for Patrigio’s Secret Shop. Did you fixed the number of failstacks when failing Concentated stones? Last patch I can get 5 failstacks from failing but now I got 2.